My grandmother, now in her eighties belongs to that generation of women whose lives revolved around the kitchen. Preparing food and delicacies to keep the family well fed and nourished seemed to be the primary motive for these women. Food affects us on so many levels, the physical, emotional, psychological, intellectual, et al. A good dinner means sound sleep. A good breakfast keeps one going through the day and a good lunch means that you are well nourished for many years to come. And women of my grandmothers generation understood this well. A good meal even once a day requires multifarious efforts. Sourcing the ingredients, planning the outcomes with the available resources, the actual preparation and the clean up after. All these duties were performed with unmatched energy and enthusiasm by these lovely ladies of yore. Besides, they had no distractions as well; in the form of social media and other modern day pressures that could prove to be an obstacle to the path of keeping their coterie of family and friends well fed at all times. Like many other dishes, I learned how to make Thambittu from my grandmother. Her store room when my grandfather was around, was neatly lined with dabbas (boxes) of raw ingredients and dabbas filled with all the delicacies that my grandfather and his friends feasted on. Invariably, one of those dabbas would have laddus, besan laddus being the hot favourite. As a child, what fascinated me was not these snacks but the freshly prepared meals that she served three times a day. The hot puris with aloo bhaji (potato gravy) that she made every Wednesday morning, vaangi bhath (a spicy rice preparation made with eggplants, huli (her variation being different from my paternal grandmother's whose recipe I have featured here) and the hot gulab jamuns that were made by her on every birthday. Thambittu, made only during festivals was not a laddu I ate as a child, but went on to become a favorite later on in my adult life. On one warm summer day in my Bombay kitchen, when this precious lady in my life was visiting me, I learned how to make this from her. She warned me, you have to use a lot of ghee! At that point of time in my life, nearly a decade ago I was wary of using/eating lot of fat and sugar. But now, with experience I have figured that certain dishes require a certain amount of fat and sweetener. And if you compromise that, then the sanctity of the dish is lost. And also, with proper eating habits and basic yogasanas and suryanamaskars done every day, I can have my cake and eat it as well. Good food is very important for my sustenance and I will not compromise the feeling of satisfaction and well being that I experience after making an authentic traditional preparation. During the festival of Nagpanchami this year, when I remembered these laddus, I turned to my trusty old blue diary where I had noted the recipe nearly a decade ago in the gratifying presence of my ajji, my grandmother as she showed me how to shape these laddus. Needless to say, I was thrilled when I was able to replicate these laddus and in turn reproduce a part of my tradition and heritage. 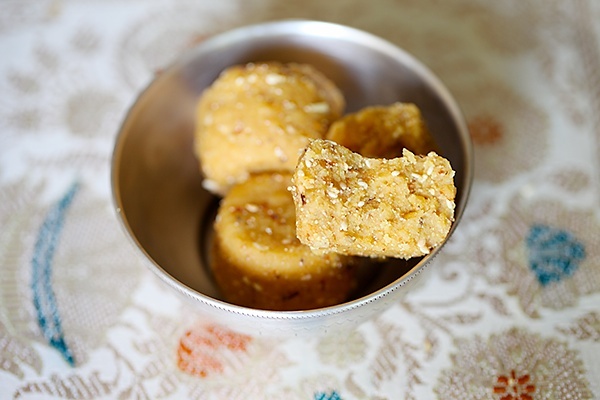 These laddus are very popular in parts of Karnataka state in Southern India and during the auspicious shravan maas, ladies invite married women, perform poojas and exchange these laddus. 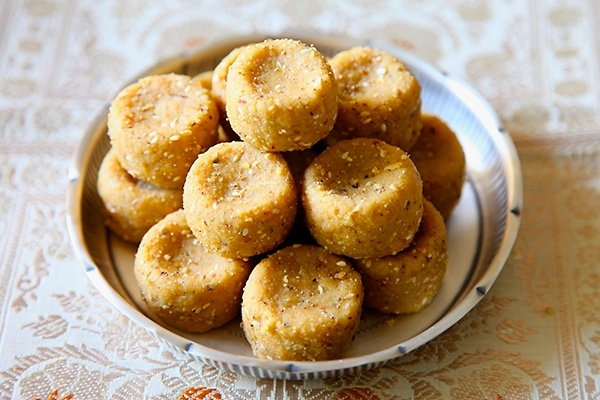 These laddus make their way into my mother’s home from at least 10 to 12 homes during this time and I miss those moments and comparisons every year. 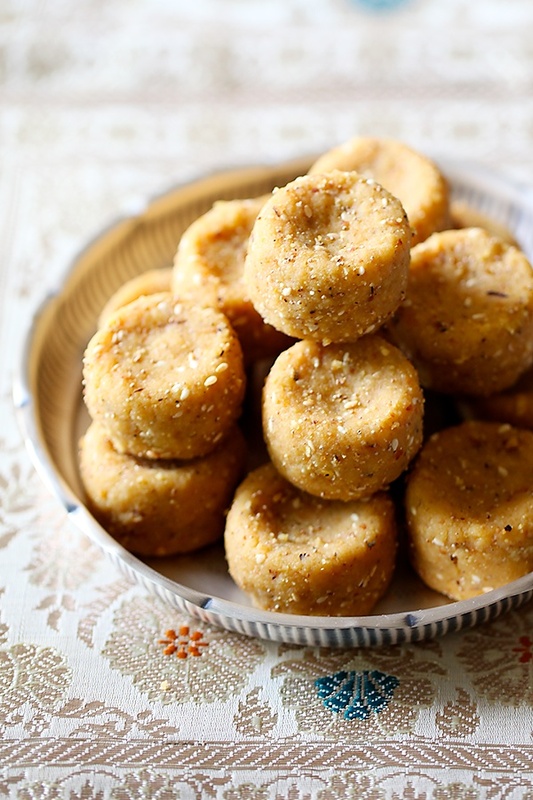 There are many variations of the thambittu made with rice flour, wheat flour and powdered roasted gram. The one that I’m fond of and relish is made with roasted gram powder. This is highly nutritious with all nice ingredients like mineral rich jaggery, nutrient dense sesame seeds, dried coconut and poppy seeds. And the ambrosial flavouring is provided by cardamom seeds.There is an old saying that goes “cardamom adds spice to your years and years to your life” and green cardamom is without a doubt one of my favourite spices. 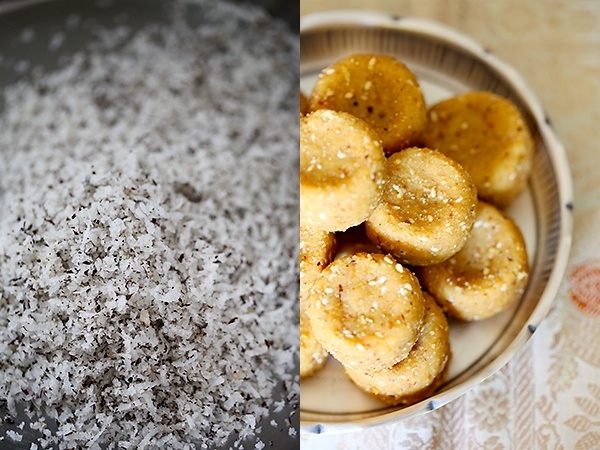 You could go easy on the sesame seeds and coconut if you wish, but I love the magic of these ingredients when combined with the rest and hence have been a little more generous with the quantities of sesame and coconut used as I love the character they provide to these laddus. Making these laddus, offering them to the Supreme and then eating them puts me in a happy state of mind. A kind of ethereal state, that gets knocked down when reality strikes after the passage of time! Will upload a video link for shaping these laddus shortly! It is important to use fresh ghee for this recipe. 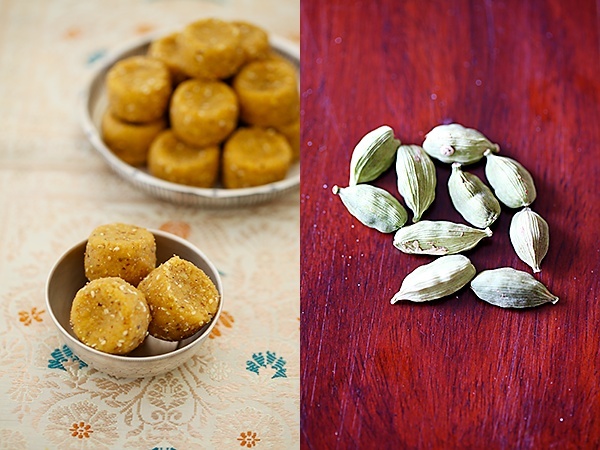 You can try shaping these laddus like the ones pictured above or you could even give them a round shape. 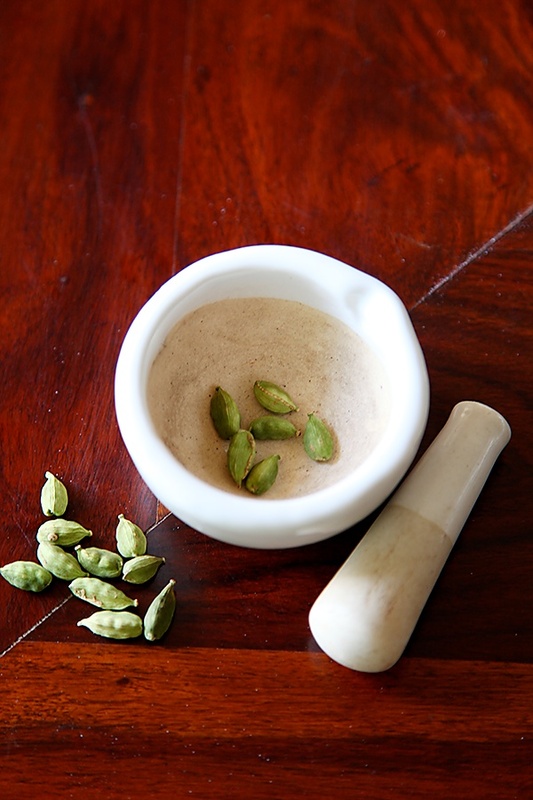 Powder the cardamom seeds with the help of a mortar and pestle or spice grinder. In a wok, heat the roasted gram for a couple of minutes, turning them over and over again with the help of a spatula or a large spoon. Remove and keep aside. When cool, grind to a fine powder. Roast the coconut until golden brown. Remove and keep aside. 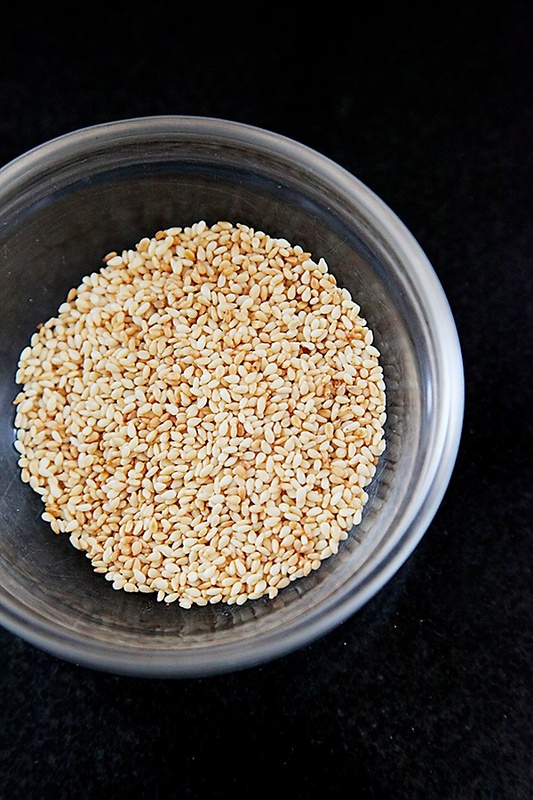 Roast the sesame seeds until they change their colour and start to splatter a bit. Keep aside. Finally roast the poppy seeds as well. Keep aside. In the wok, heat the ghee and when it melts, put in the jaggery. On low heat allow the jaggery to melt and when it melts (don’t allow the jaggery to come to a boil) stir in the roasted and powdered gram and all the other roasted ingredients. Turn off the flame, put in the cardamom powder and mix well. You may find the mixture a little loose at this point. If you find it very loose stir in a little more of the powdered gram. When the mixture cools down, it is time to shape the laddus. Press the mixture with your palm to give it a round shape and then hold the laddu with your left hand and keep rotating it while pressing the top portion of the laddu with the fore finger and the middle finger and the base with the thumb. You can also give these laddus a round shape as desired. Makes 38 to 40 laddus. Very nice nd healthy receipe. ur blog nd never want to miss it. Hey Anu!! I am in love with this recipe, can't wait to try it! And your grandmother is so beautiful, so full of grace and poise, loved your pic with her!! These look delicious! I love roast gram. Definitely will be trying this recipe. Poonam: Thank you for the inspiration. Ambika: Thanks. She is known for her grace and poise in our family, apart from her ccoking ofcourse. Kalyanie: Hope you will love these delicious laddus. I have no words to express my feelings Anu! truly nostalgic….and the photographs are just GR8!you and your grandmom (Ajji) look stunningly beautiful,gorgeous and graceful! lovely post. 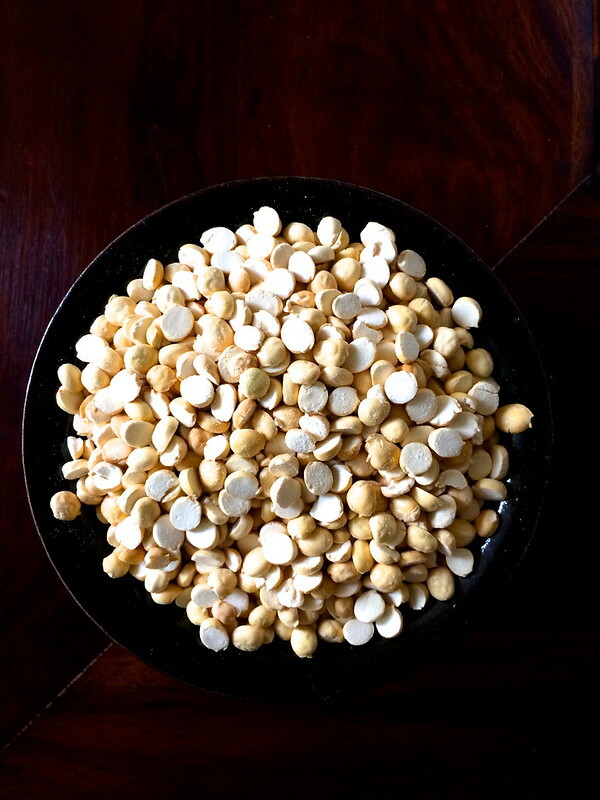 Elaichi is one of my absolute favourite ingredients. There have been times when people have refused the sweet dishes I prepare because of elaichi(since they don't like it) I cannot understand people who don't like elaichi hahhaa the conclusion of that 🙂 I love the story, the recipe and your beautiful grandmother. Lovely recipe. I see bit of red specs and tiniest red threads in your laddu photos. I gather that is saffron but it is not included in your ingredients. Is saffron required for this recipe? coralcrue: You are right! Can't imagine how anyone cannot like cardamom! Bena: The red specs that you see are nothing but golden shreds of coconut when roasted well. The ingredients listed in the recipe are what go into making this laddu. Saffron is not used here. Thanks for sharing this recipe. I remembered my ajji ! I have tried out many of your recipes and they have turned out well. I have a request. Could you post Vangi Bath recipe? Everything about this post is beautiful! The laddus, the pictures, your grandmother, yourself(!) and the lovely feelings with which you have written this post! Thanks for the wonderful recipe and the inspiration to cook! Will try these laddus at the earliest opportunity! I really like this shape. Thanks for sharing with all of us. I also agree that it is a fortune to have elders around. They are so wise and full of warmth. Vasumathy: Thanks. I'm really blessed. Jayashree: Thanks for your kind words. WOW… what can I say ? Reading your posts brings back such warm memories of our lives back home. You manage to spellbind your readers !!! !Love to read your posts and such wonderful pics as usual. Needless to say the pic with your Grandmom is the best. 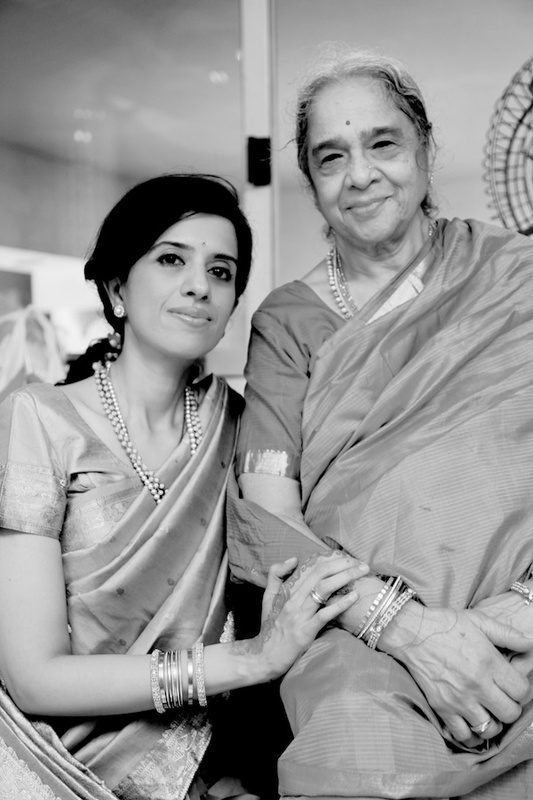 Two beautiful ladies of different generations but similar mindset respecting traditional values……Love the laddus on the silver plate. Looks so inviting. I'm sure Lord Ganesha is going to gobble them all up and bless you abundantly….keep posting often. Very nice laddu recipe, with nice photos. Lovely post and looks like a good recipe to try. However we do sometimes have this problem with the jaggery,they contain tiny stones or sand. So is it possible to use filtered jaggey syrup in this recipe? Shirley: Thank you for your support. Good wishes from good folks like you is one of the most important factor that keeps me going here. Ashwini: Try and use good quality jaggery. The jaggery is just melted here and no syrup is made. Thanks for this wonderful recipe. Though I made this as part of my Diwali preparations, doesn't look like it will last the weekend. The family was devouring it while made the laddoos!! Rashmi: That's great to hear! Happy Deepavali! Happy Deepavali to you and your loved ones too. I made these delicious laddus as a part of my Dipavali puja offerings and they won me appreciation from my family members and relatives. Felt very touched. Last year also I had made your Dry fruit burfi for Dipavali and impressed everyone. Thank you so much for the quality work you are doing. A great boon for all of us who are looking for new, 'trustworthy' recipes!! Jayashree: I'm touched by your kind words. Thanks for your appreciation. this recipe looks absolutely divine.. i love all your recipes as they portray your true passion for nourishing whole food made in tradional ancient way. I love this recipe as it's so good good made with simple ingredients like ghee, grams and jaggery..I have a 3 year toddler and I am always looking for ways to get creative with her lunches and meals. This will be perfect for her. 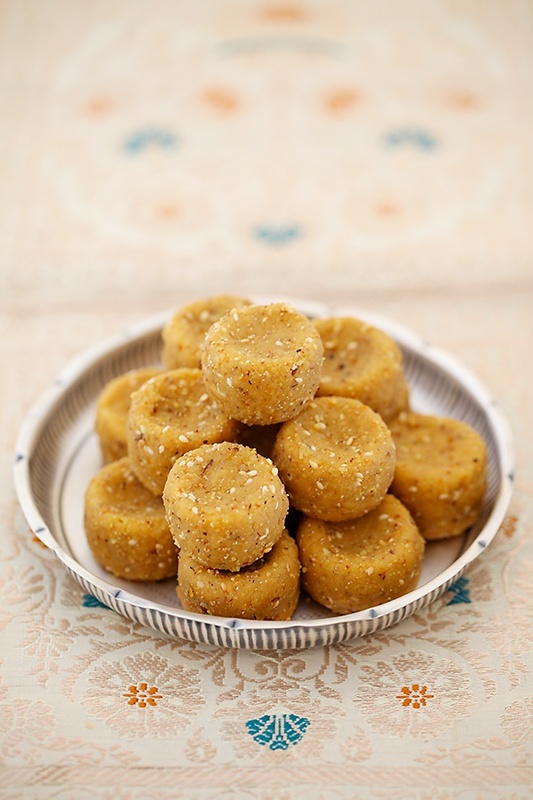 Could you do a post for toddler lunchbox.. also I saw a glimpse of these Ram laddus on your instagram they look so yummy could you do a post for those as well.. Thank you for sharing your passion. PS i love all your youtube videos.. I look forward to watch them every week.. you a doing such a great job..
Payal: Will definitely keep the laddu in mind. Will be doing toddler lunchbox recipes even on "Divine Taste With Anushruti" so stay tuned! Thanks so much for writing and letting me know that you are enjoying my show. Yes, these laddus will be perfect for your 3 year old! Good luck and stay in touch! suman- So glad to hear that! I just wanted to compliment you on your blog and the wonderful photos and recipe. And a request: if you are EVER curious about animals and how they are being abused so that humans can have milk and ghee, try to browse thru vegan websites of the PETA website. I am not judging here at all, just thought I would give you this info because of the comment you made about 'ghee being mandatory' for this recipe. We make all Indian recipes using organic cold pressed coconut oil instead. And the Ahimsa associated with that makes me feel so much better. I loved reading your blog, with memories of grandma and traditions and everything! Regards and thanks for taking the time to write the blog and post recipes! Thank you for sharing such a wonderful recipe. Would try it in a day or two! What is tes shelf life of these laddus and can I use desiccated coconut instead of fresh one? Is it possible to use sattu flour for this recipe? 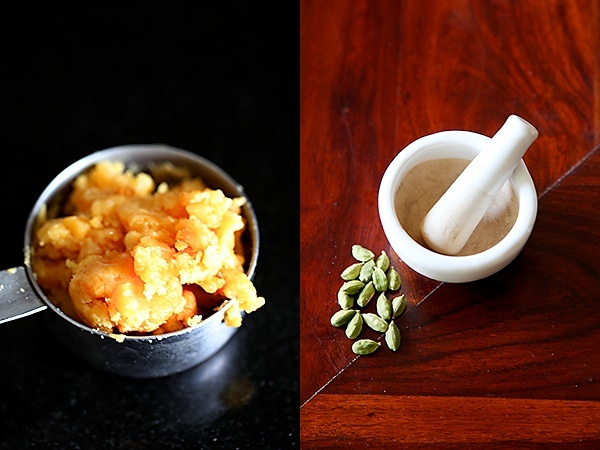 Can i roast sattu flour and add it to the ghee jaggery mixture at the time when you add roasted gram flour in your recipe? Piyusha: This is a very traditional ancient recipe I wouldnt tamper with. If you happen to try with sattu flour, do let me know. Thank you. 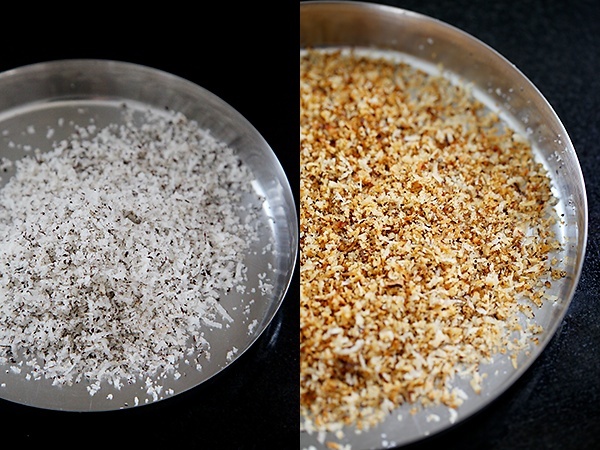 This recipe requires the use of desiccated coconut or dry coconut. You cant store this in an air tight container for upto 30 days.